Schoology allows a variety of ways to organize a course. 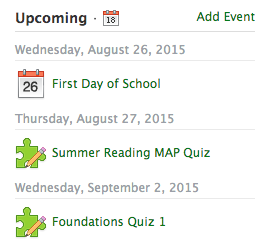 I mainly use Schoology calendar events to guide students in my course. I use the calendar over folders or updates because I structure my course with daily objectives and activities. Calendars are how I plan, so it makes logical sense to me to use the calendar. For students, posting all of the contents for the lesson in the daily calendar focuses students right away with an easy to follow routine. At the start of every class, students go the calendar to begin. In the pictures below, the calendar is shown on the right display on the iPad or web. If you have upcoming quizzes or assignments, the students are exposed to tasks that need attention. Daily routines keep students focused and guide behaviors into learning focused activities at the beginning of class. In the calendar, I can post the objective for the day, step by step instructions, images, videos, worksheets, readings, and web links. I often post images for my bell ringers. Students can see the images in color and zoom for further analysis. I post the question right there in the event. This way I do not have to have a PowerPoint slide cued or write it on the board if I am coming into the class in a hurry. 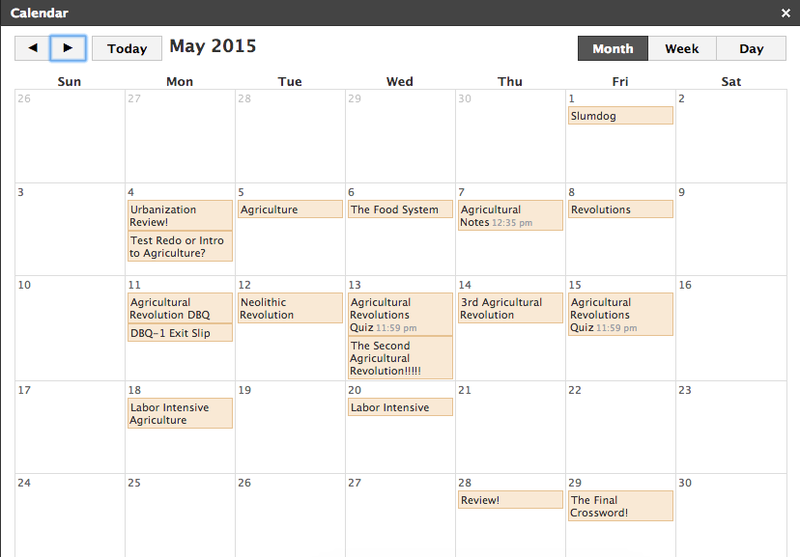 Calendar events allow students to post comments. I often have the students post their answers to the bell in the comments. The calendar is great because it is ONE location for the entire lesson's materials. The students do not have to go to a discussion for a simple warm up or exit slip. They can respond to other's comments, ask questions or do almost any feature a discussion can except grading. For quick participation, the calendar is great. There are less transitions for students to get lost in the shuffle. It maximizes classroom time and allows for total participation. 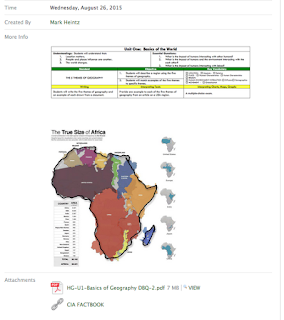 It is really easy for students to post new comments. Students can see all comments made. Also, the calendar houses all of the daily materials. There is little redirection for students to access any of the daily materials. I teacher regular level freshmen, so I try to minimize transitions. Another benefit is the students can go back to the event for any of the daily activities. If you are using pdfs, the event can have the links that students wouldn't be able to click. At the end of the class, the calendar provides the opportunity for teachers to have an unplanned exit slip. If there is extra time, you can have students post three things they learned, a question they have, a summary of the lesson, or anything else you normally do as an exit slip. The best part, if you created the event, there is a venue for students to post comments without creating anything new! Another great feature of the calendar is it automatically archives the event. Students can go back to any event in the entire semester. If they miss a day they can go through the calendar and see everything they missed. If you want to know more about how to do specific features in calendars, Schoology created a how to page. You can access it by clicking here. This looks awesome Mark! I didn't realize how functional the calendar could be....thanks for sharing! Thank you for the comment, Dan!